The below policy outlines how Clyde Fasteners gain, obtain and use your Data in accordance with General Data Protection Regulation (GDPR). We take Data Protection very seriously and will endeavor to keep all personal data safe and secure. We will not share any personal data with third parties without your consent. All details on how we store, retain and use personal/business data is listed and explained below however if you require further assistance please do not hesitate to contact our Data Protection Officer. All personal/business data disclosed to Clyde Fasteners will be recorded and stored on our CRM System of which is located on our secure internal server. We do not store any personal/business data on external devices. We will not transfer any personal/business data outside of the EU and Clyde Fasteners are fully aware that data received within the UK is governed and secured by the GDPR. Please note that should your details be supplied to our relevant third parties you have the right to be forgotten and can request that your details be removed, deleted and blocked from further contact from Clyde Fasteners. Any data that we are unable to delete due to legal reasons would be blocked instead of deleted. You have the right to withdraw your consent for us to collect, process and store your data. You have the right to request a copy of all your personal/business data held on file by Clyde Fasteners, this is called a ‘subject access request’. To do this please request a copy by contacting our Data Protection Officer as shown below. You have the right to complain if you feel your data is being neglected or that you feel your privacy has been breached by us. To exercise your rights please contact our Data Protection Officer. Rest assured Clyde Fasteners will enforce and provide stability for your personal data. All our data is held on our internal servers and no unauthorized access is allowed. To prevent any Data Breech, Clyde Fasteners have in place managerial, physical and electronic procedures to secure and safeguard data submitted online. We work hard to make sure all hardware and software is of a high standard and provides ultimate security for all personal/business data. Please note that Clyde Fasteners are required and obliged to disclose your personal/business data when called upon by fraud prevention agencies, law agencies, regulatory bodies or government bodies, without your consent. 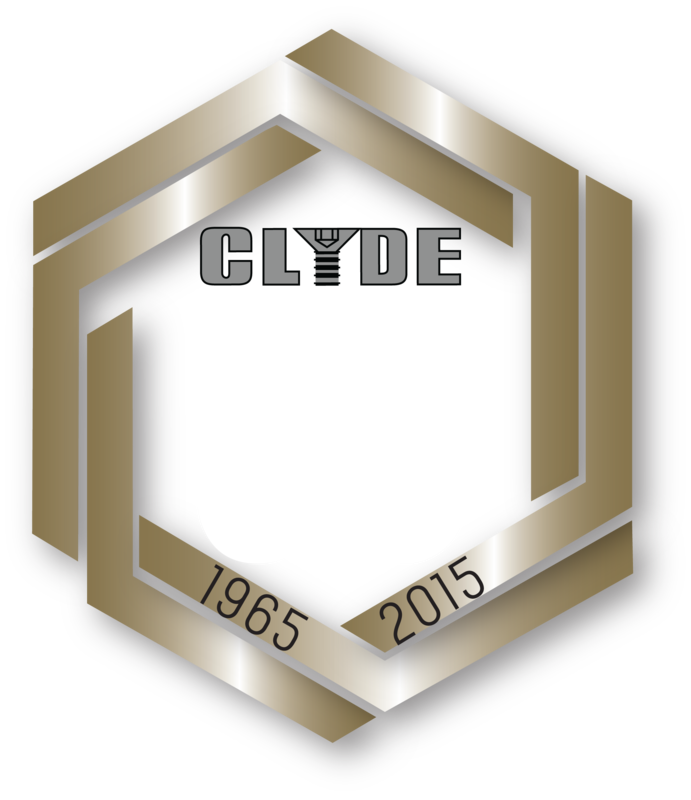 Clyde Fasteners will store necessary and relevant data for a maximum of 6 years for legal obligations, audits and for defense of any legal claims. Clyde Fasteners cleanse all data held continuously to make sure all data is correct, relevant and necessary to retain. Highly sensitive data such as ‘Debit/Credit Card Details’ are not collected. Please keep us up to date with any personal data changes. We will make every effort to inform your relevant third parties of whom will require these details. You can subscribe to our email marketing by clicking here, if you have already subscribed and are wondering how we use your personal data see below – When you subscribe to newsletters you can supply as little as just your email address. We do not make you supply more personal data than is required so that you have full control. Your data is held on our secure internal server with authorised access only. All data emailed to is cleansed after each send and if you wish to unsubscribe you can do so by clinking unsubscribe at the top link of every email received. Unsubscribes are actioned accordingly and prior to any further sends. Our Newsletters sent are relevant to the services that we can offer and informative in relation to the skincare/technology sector. This site uses Google Analytics to track website traffic, to help improve the website structure and determine how user friendly our webpages are. We also use analytics to track the cost/benefit analysis of our promotional campaigns. Analytics uses temporary cookies to gather anonymous information about our website users. This information can include but is not limited to the users IP address, Location, the device they are using, the referral website, the page they are looking at, how long they looked at that specific page and if they converted to a lead. This information is stored in a text file called a cookie. The cookie is placed on the user’s internet browser system and can be called upon by Google and us to produce detailed reports. With each visit to our site, the cookie is transmitted to Google in America, where the data is stored and may be passed on to third parties. We will analyse the reports and use the information to create a more user-friendly website and to correct any errors. We will also analyse the reports to ascertain the performance of our online presence. We use the data for statistical purposes only and then it is removed from the system. We will not attempt to personally identify you from your IP address unless required to as a matter of law or regulation or to protect our or our customers’ rights. You can delete existing cookies and prevent the installation of new cookies at any time through the settings in your web browser. Google AdWords is a service, provided by Google, that allows an advertiser to place their ads in the search engine results and the google advertising network. The advertiser must use pre-set “keywords” and supply a relevant ad to be shown in the search results, when a user searches for those specific keywords. Googles automatic algorithm will assess the relevance of the ads in conjunction with the keywords and the landing page; only allowing the most relevant ads to be shown at the top of the search results. In the Google Advertising Network, Google uses another algorithm to distribute relevant ads onto relevant webpages, according to those keywords. Remarketing allows the advertiser to display additional adverts, on participating websites, after the user has left the advertisers website without converting. When a user clicks through to our website from a Google ad, a tracking cookie is placed on the user’s web browser. This cookie will hold information on the user for up to 30 days before expiring. This information can include I.P addresses, Web browsers used, pages visited, and actions completed but it is completely anonymous – neither Clyde Fasteners or Google receive any information that could identify the user. Each time the user visits our website this data is transferred to Google in the USA and stored for statistical purposes. Google may pass the data on to third parties. Our Information Newsletters contain MyTracking links. These links are embedded in the hyperlinks of our email HTML code. They allow Clyde Fasteners to analyse the effectiveness of our email campaigns. Using these links, we can see who has opened the email and what links they are interested in. We use this information to optimize the best layout, time of send, the best deals to advertise and help keep all information relevant to our subscriptions. You can opt out of email tracking and subscriptions at any time. You will find the unsubscribe links in our newsletters at the top of the page or you can email info@clydefasteners.com with Unsubscribe in the subject line and the email address you wish to unsubscribe in the main body of the email. Once you have unsubscribed your data will be deleted from our marketing subscriptions and you will not receive any more newsletters from Clyde Fasteners. Originally founded in 1965, our organisation has developed significantly by organic growth, both in personnel and product, with strategic direction to be one of the UK's main players in the sector. Investment commitment will ensure our position over this decade and beyond.